ADDITIONAL CLASS OPENED - Spaces Filling Fast! Learn how to successfully sew challenging fabrics such as leather, fur, chiffon, cork, knit, Cuddle and more! Learn seam and hem finishes to sew like a pro on various fabrics. Discover ways to make sewing easier by using proper feet, stitches and features of BERNINA machines for precise sewing. Be inspired and encouraged to sew as you learn how to successfully work with all the new textiles available using traditional techniques. 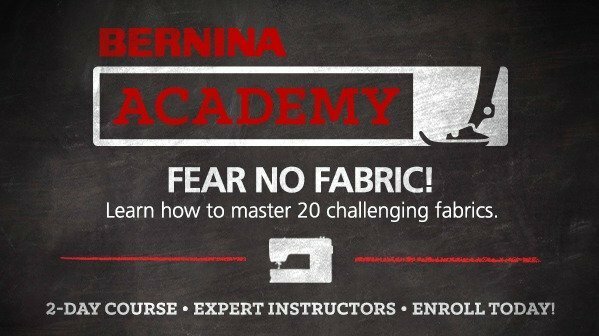 You will graduate BERNINA ACADEMY with a completed BERNINA Academy Technique Book with 20 finished sewing samples and the techniques for Mastering Challenging Fabrics. In addition, as a graduation gift, you will receive the collectible BERNINA Academy USB stick which includes information on fabric care, needles, inspirational projects and instructions to inspire you long after the course is over! Morning snacks and lunch will be provided for both days. Class cost is $ 199.00 and includes supplies, morning snacks and lunch.